This week, like most weeks, I made some mistakes… I’d like to pretend that they didn’t happen, defend, or gloss over them. But, I know better. Better to retrospect and find a way to address, avoid or automate in the future! I also recently heard David Marquet (author of It’s Your Ship, great book) speak and started listening the the Audible version of his book for the second time. He references learning from mistakes, too. See one of his posts here. Back to my personal retrospective, I keep a paper notebook at home, and from the front page of the notebook I write the date and a sequence of things that I am grateful for. Some items are small, some are large. Gratitude acknowledges. Gratitude celebrates. Gratitude energizes. Don’t miss this step! Next, I flip the notebook over and rotate 180 degrees, like an old-fashioned double-book with two covers. And I proceed to write down everything that concerns me. Be it a mistake I made, or a challenge that is beyond my control. I summarize all the many problems, leaving room for a few lines of solutioning under each one. Next, I reflect on each! Thinking about options for going forward. Imagining a better future. And after a day or two and sometimes longer, I am able to fill in a solution or improvement under each concern. The brain keeps working on problems in the background til some closure is reached. Imagine thousands of background tasks running on your laptop, and each day more new “processes” are spawned. No re-boot possible. What a slow computer! You need a way to “end process tree” on some tasks. So there is free capacity to a address new challenges that will crop up throughout each day. From a practical perspective, you already “paid” for whatever the issue cost in terms of time, energy, and angst to date. And in return you received some learning. Take the learning and put it to good use! From a spiritual perspective, each positive and concern listed becomes a prayer, and, with faith, persistent prayers are eventually answered, one way or another. There could well be upside! It’s highly likely! Or, at a minimum, you will be able to help someone else facing a similar path. Get up. Pay it forward. From an agile perspective, by holding a personal (or team) retrospective we capture the learning, make resolutions, and clear space for new priorities. Your turn, what will you learn today? When faced with a limit that changes the way I was planning to go, I first get mad. Why is that limit there. Who is responsible for that? Let me go talk with them. Maybe they don’t understand the cost and repercussions of this limitation? In other words, I move into action, too fast! Where are you being pushed past your limit and allowing something to occur…? I see that the two questions could be in conflict. It’s not always easy to find solutions that work for everyone’s limits. And still it is critically important to try! In church today were challenged with a message about Necessary Limits, from 2Cor12 “Now I take limitations in stride, with good cheer…” What timing! In weakness, strength is possible. In weakness we are humbled and start to ask for help. We become open to change. We become curious. Curiosity assumes there is reasoning behind the limit! …Assuming there are a good reasons for the limit, then ask questions of curiosity. Who might benefit from this limit? In the future? What good can we make from this limit? What other paths can we explore? What are some innovative alternatives that honor and learn from the limit? Teams need feedback, and boundaries. We want to have in a collaborative culture. One with high trust. It is important that we do not tolerate, condone, or otherwise support when we see or hear toxic behaviors. Here is a link that helps explain toxic behaviors and their effect on teams here http://www.beyondtheleadingedge.com/192/leading-edge-news/teams/the-four-team-toxins/ . I first learned about this model from Lyssa Adkins – it provides a powerful lens for surfacing team challenges. When you see Team Toxins, please give feedback privately to the person. Or come and talk with your manager or a trusted coach so that they can help you address. One good model for giving feedback is http://www.manager-tools.com/2006/10/the-peer-feedback-model . Always a heated and interesting topic. The best topics are both, right? I love this great deck (link below) from Ed Kraay. Really provides thoughtful guidance about the value of flexibility. It’s like that old adage of giving decisions to the people closest to the work. If possible, give teams options. And also allow them to iterate and change later too. The work changes…Why choose to be stuck in one layout? And here is a University of Michigan study that talks about the direct productivity results of teams given their own shared work room. Of course, quiet space is also needed. Just like at home. If one of us is going to sleep at say 10pm, the others can’t be listening to loud music or TV. Even a loud conversation would be disrespectful to our housemates. Same is true with sharing space at work…. Teams do not want to hear the constant distraction of other teams’ work which is unrelated to them. Fellow managers, we are just the boundary setters. Be clear on the space available, the tools, and the budget. Then give the rest up to the team. If some of the team members lead the team to make anti-collaboration or toxic decisions, then it is our job as managers to step in and manage the individuals. Wow, makes me a bit tired just reading that list. Sounds a bit like riding a bicycle and juggling at the same time. Daunting. Reflection is key. 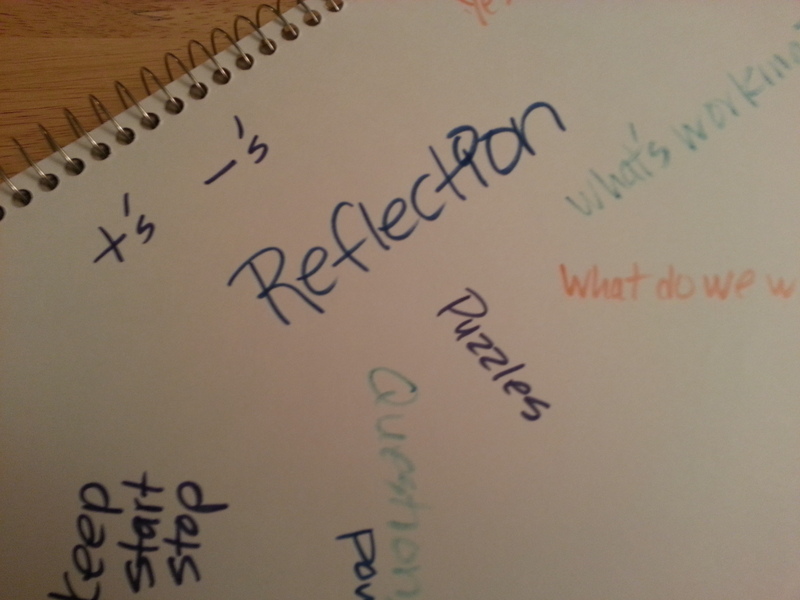 Reflection and a decision to commit to one change. Long ago Tobias Mayer introduced a group of us (agile scrum team) to “commit cards” where following some retrospective discussion, each team member commits to one thing, and writes that one thing on a card for the rest of the team to see. And, as a team, we do it all again two weeks later. It is amazingly effective. Try it! On a personal level, reflection is also important. When I examine my life, my actions, my strengths, weaknesses, mistakes, and opportunities, then I have a chance to commit to practice being different. A chance to grow. Recently, I embarked on a different type of retrospective. A personal 360 survey from www.360reach.me . Lots of interesting insights. I can see that the way that I am perceived in the survey aligns closely to the way that I see myself, which is encouraging. I can also see my weaknesses clearly outlined in the data, and even more compelling is that the comments clearly show that I need to be more aware of those weaknesses, because they shed light on the times when I hurt others feelings and shut others down. I become laser focused on a goal or an idea, and stop seeing the people around me. Strengths can also become weaknesses when taken to extremes. Our weaknesses are patterns that come out when we forget to honor our values. What are your values? Are you honoring your values today?